Where it’s headed. Content marketing is here to stay. It’s an important and effective way to connect with clients throughout the year, as well as to reach the right prospects. The trend I see for 2019 is increased use of original content instead of solely depending on white-label articles. This is particularly important for topics that differentiate you and resonate with your target audience. How to execute. Writing original content may be easier than you think. My favorite content marketing exercise is to write down the top 5–10 questions asked by clients and prospects. Or, compile questions you get on a daily or weekly basis that would translate into great content. Even a post about good, local restaurants could be helpful for clients when they are scheduling appointments with you. Use eye-catching headlines, write about evergreen topics that can be shared again and again, and share content that your target really cares about. Another exercise is to cull topic ideas from problems you are solving for clients. A financial advisor recently shared with me that a prospect earning $500,000 couldn’t live on his income and cashed out stock options to afford his lifestyle. Talking about that situation would make a great blog post: discuss the hazards of cashing out stock options now instead of treating them as a long-term investment vehicle. Where does this content go? Blogs are very popular and can be a powerful tool, but only if you have followers who make the content travel for you. Turn your brainstorms into a blog content calendar that pairs with your marketing plan to keep you publishing regularly scheduled and relevant posts throughout the year. You can use social media to drive traffic to your blog, or you can e-mail the content to specific groups of clients. When to delegate. I understand writing original content frequently may take more time than you have. To streamline the process, you could tweak and revise white-labeled content to make it uniquely yours. You could also hire a freelance writer who understands your industry, clients, and prospects. Another time-saving option is to curate content from other publishers. If you find an article that your audience may be interested in, all you have to do is draft an introduction and provide the third-party content. Hootsuite does this each week on a blog post titled “This Week in Social,” which aims to keep social media managers informed of important news from the week. Where it’s headed. Social media use by financial advisors is up from previous years, as many are realizing that it can be an effective way to connect with clients and keep them up to date on what’s happening at the firm. Advisors are also seeing success using social media to attract prospects and engage with the local community. So, what’s important with social in 2019? The trend continues to focus on providing engaging content that is attractive, helpful, and delivered in a way that makes it easy to view. How to execute. Social media platforms have taken steps to help make content more engaging by transitioning from a traditional news feed to storytelling formats. On Twitter, you can tell a story by using threaded replies and linking tweets together. To do this, open a new tweet. Once you begin typing, you’ll see a + button appear next to the Tweet button. Use that to create additional tweets that are connected to the first. You can include the word “THREAD” on the first tweet to show that there’s more. Use this to share a mini blog post, start a series, or provide details about an event. LinkedIn is developing its own storytelling format, but it’s starting with an application just for university students, so it’s not expected to be available to everyone else for a while. What can you do in the meantime? Continue to save posts and articles within your profile. Posting to social media frequently and consistently adds to your engagement level and will never go out of style. Don’t forget to respond to comments posted on your social media pages in a timely manner. Also consider commenting on your clients’ stories and feeds—but only if you have an established relationship and it makes sense to respond. Where it’s headed. Video content is expected to become a whopping 80 percent of what we consume online this year, making it one of the most engaging top marketing trends for 2019. People prefer watching a video over reading, and they like to view a video before making a commitment. How to execute. Research varies, but the best length for a video appears to be one minute or less. (Remember: people have short attention spans.) That doesn’t mean you can’t produce a longer video—as long as the content warrants it. You could create video blogs, video interviews, tutorial or advice videos, and videos of presentations. Talk about what you do in the community. Share what it’s like to be in your office. Take your top content topics and make videos about them. Take note that 85 percent of videos viewed on Facebook are watched without sound, so use captions. Most people watch videos on their phone instead of on a desktop computer, but your video content should be designed for both (640 pixels wide for a phone and 1920 pixels wide for a large monitor). 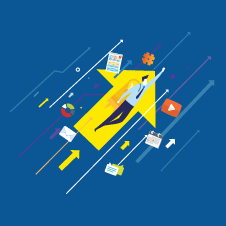 By employing all three of these top marketing trends for 2019, you can help increase your firm’s visibility and accessibility, as well as help improve client acquisition and retention. Share blog posts through a monthly e-mail to subscribers and through social media—you can even submit them to your local paper. Include two or three share buttons on your blog, so that people can easily share content to their social media profiles. Share videos on your website, blog, and social media, and e-mail the links to your clients and prospects. Create different versions of your original content and post the information to your blog and social media pages; format it for an e-mail that links to your website; and create a video about that same topic. With this integrated approach, you can stretch your reach much farther than you originally expected. Isn’t that the goal at the beginning of each year? It’s time to make it happen. Do you have plans to leverage video in your marketing plan this year? What other tactics do you use to connect with clients and prospects? Please share your ideas below!